Can you identify the people in this photograph? 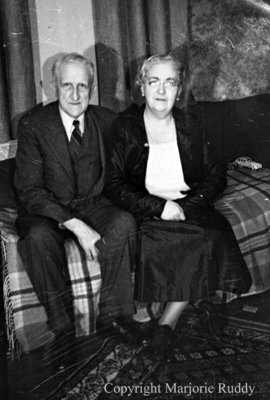 Black and white negative of an unidentified man and woman sitting on a couch. The couch is covered with a plaid blanket. The man has his arm around the woman and she has her hands in her lap. This negative was part of a negative strip that was found rolled up in a wooden box without any identification of the people or places in the photographs. Written on the wooden box: Marjorie Ruddy negs 45 each. Unidentified Man and Woman, c.1945, Marjorie Ruddy. Whitby Archives A2013_040_857E.